the DOHMH [failed] to establish the required advisory board to oversee the health and safety of horses. As a result, DOHMH lacked written rules regarding the horses’ health and safety. The ASPCA regularly and voluntarily inspected the horses and their stables, but had no contract or official agreement with the City for the work. Auditors noted that the ASPCA could cease or reduce inspections at any time, leaving a void in the City’s program to protect horses. So basically, outside of the ASPCA, the City has no formal system of protection for one of its most cherished tourist absurdities attractions. Department of Consumer Affairs continues to be noncompliant with the Administrative Code and the Rules of the City of New York that require they conduct carriage inspections at least once every four months. So despite the glaring loopholes in the administrative regulation of them (what exactly are the DOHMH inspectors using, exactly? ), one might wonder what is so bad about horse-drawn carriages in the first place. We used to use horses as a main method of transportation anyway, right? (Side note: we used to do a lot of things.) I have to admit, I was a little surprised when I saw Kelly Clarkson on the side of a bus stop on 10th Avenue in an advertisement to “Ban Horse-Drawn Carriages in New York City.” I just assumed horse-drawn carriages were a fact of New York City life, never to be questioned; they have been around for a while, after all. After doing some light research, I realized this is somewhat of a hot topic; the go-to website for the movement seems to be here. To me, horse-drawn carriages are the equivalent of circus animals, and the cruelty issues that arise from keeping them are equally disturbing. If you are thinking of visiting New York City, do the responsible thing and get a pedicab. You will be tipping a person who is actually doing the manual labor, and you still get the novelty of an open-air ride through Central Park. (Also, stop standing in the middle of the sidewalk to take pictures.) As for people who live in New York, suffice to say you are probably not riding in horse-drawn carriages very often. If the idea of forced animal labor doesn’t exactly pull at your heartstrings, a true New Yorker will at least admit that she’s annoyed by the traffic congestion caused by the carriages. I am not really sure what the status of the NYC movement against horse-drawn carriages is (you can check out other thought-provoking posts on this topic here and here), but I think awareness is a key element to the progress of any movement. So the n ext time you see a horse in full circus gear in the middle of Times Square, please do not mistake it as a charming tourist attraction, and see it for what it is: wrong. you state one you know nothing about horses ( made clear by this blog) also that you know nothing truly about the issue, YET here is your blog saying you side against the Horse Drawn Carriage. how did you form your opinion then? By knowing nothing can you truly know your opinion? How do you say it is cruel and wrong when once again you know nothing on the topic? Kelly Clarksons face convinced you that clearly horses hate their jobs and are abused in their professions. would Kelly Clarksons face also convince you that you having a dog in the city is wrong, or that you in general are an affront to the environment ( by Peta standards, the leader of this movement you are by the way) . My problem is that you have done little to no research and yet act as if you are stating facts, while at the same time saying you have none. 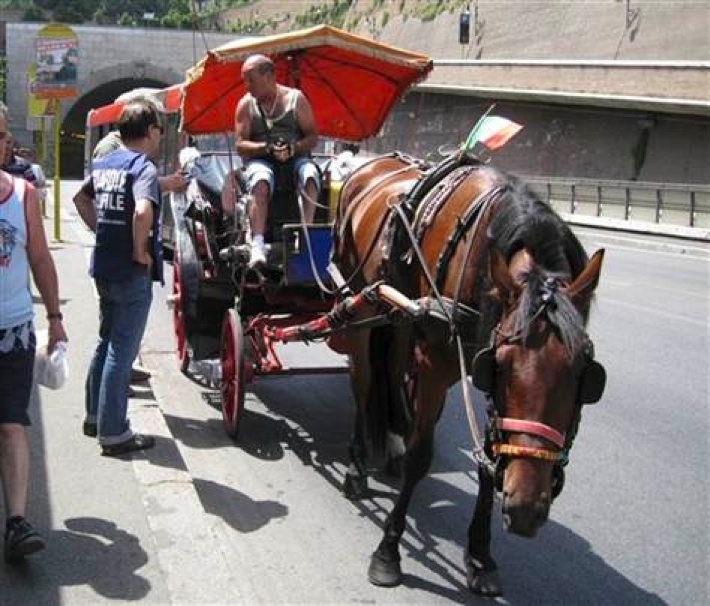 The Carriages govern themselves, and actually have stricter penalties on themselves, and rules about the treatment and care of the horses, than the ASPCA and the city ask. all the horses are required months AWAY from the city, food and water while working, they are not allowed to work more than so many hours so many days a week. all their drivers have to be trained, not to mention how large their stalls are. Now as far as circus animals really? i want to know how people really imagine that all these “horrible” cruel industry’s are truly so abusive, there is a BLINDING light focused on them at every single millisecond a day. not to mention that is their source of income. now do you go to your job and cuss your boss out and treat it horribly? no you wouldn’t have a job, so how is it that people who employ themselves by using animals are some how thought of differently. common sense states that 99.9 % of the time horse and carriage operations are treating their horses better than their children. why? because who feeds their children? research is fairly important, perhaps you should try some more. i am not trying to attack you or your beliefs, i simply believe before making your opinion so clearly known that you should have ALL the facts on both sides, no matter how much you detest one or the other. after knowing everything then you make a conclusion, scientifically speaking ( as we were all taught) that is truly the only way to find the truth. Oh, my. Your obsession with the feathers, flowers and top hats of the traditional carriage driver and his/her horse makes me think that you are a devotee of a 1908 essay by the Austrian architect, Adolph Loos, Ornament und Verbrechen (“Ornament and Crime”), which is a classic not only of slavish devotion to “modernity” but also pseudoscientific. Anyway, with regards to the “walking, walking, walking” of the carriage horses, did you know that wild horses walk anywhere between 15 and 25 miles a day? No, you probably did not, given that you yourself admit you know “nothing” about horses. The vast majority of a horse’s day is spent either walking or standing. They don’t “run around wild and free” very often, even when they are ostensibly “wild and free” – all those photos of wild horses running were most likely taken when they were either being chased by BLM helicopters or otherwise frightened by the photographer. Meanwhile, there are literally hundreds of thousands… or even MILLIONS of horses in the United States who would gladly trade places with a New York City carriage horse. More to the point, to answer the specifics of your concerns about NYC carriage horses, here are some FACTS. Carriage horses, by law, must spend AT LEAST 5 weeks per year on turnout at pasture. MOST carriage horses spend much more time than that on turnout – frequently half the year or more spent on the farm. Carriage horses cannot work more than 9 hours in a 24 hour period. They must return to their stables if the temperature gets above 89 degrees or below 18 degrees. They have regulations requiring horses waiting for fares to be blanketed in the winter when the temperature falls below a certain point, and must wear rain sheets when the temperature falls below 55 degrees and there is precipitation. Carriage horses do get to turn around and lie down quite comfortably in their stalls. They even have room to roll if they want (believe me, I have seen a NYC carriage horse do this). Carriage horses get plenty of water, both at work and at home. The carriage horses are in fact inspected and overseen by the DOHMH, the DCA, and the ASPCA. Citations for violations can *also* be issued by the NYPD and the Parks Police. An audit of the ASPCA’s actions re: carriage horses found that in 2008 the ASPCA agents and vets inspected the carriage horses at the stands 260 days out of 366, without issuing more than a handful of citations – and the NYC carriage operators have NEVER been cited for “animal cruelty” by the ASPCA or anyone else. Carriage horses, by law, must receive a veterinary exam twice a year, and must display the most recent vet exam, a copy of their current license, and owner information on their stall. Carriage horses may not begin work in the city until they are 5 years old (compare that to racehorses being raced at 2 and 3 years of age) and must retire when they reach 26 years old (though many may retire before then, usually in their early 20s). As a part of Blue Star Equiculture Draft Horse Sanctuary and Organic Farm, a 501c3 draft horse rescue – and the OFFICIAL retirement home of the NYC carriage horses, I have toured the NYC carriage stables with a large animal vet, who found that the horses not only were all happy and healthy, demonstrating NO stable vices, but they were also in better physical condition and in better mental health than the horses found in most riding barns. Or feel free to ask! Thank you for your responses. Before I submitted this post, I had read through the comment sections of related posts on this blog and knew this to be a polarizing topic. I am extremely grateful for your insight, especially given how many sentences in my post ended with a question mark (para. 3 especially). I think the main point of me writing this was that I wanted to highlight why horses in the city seemed so inherently wrong to me . You are both certainly correct in that this feeling of guilt which inspired me to write this post was gained without research– it is simply my instinctive response when I see horses in traffic on 9th Avenue to assume that they would rather be in a pasture and not forced to walk the concrete streets of New York City. I also agree that these horses probably have much better lives than race horses, but that argument isn’t very persuasive since I would never use race horses as a standard. In other words, I am sure they have much better lives than many abused animals as well, but that does not per se mean that this is a good thing. I appreciate the links to the Equiculture websites. I was aware of the time the horses spend away from the city, as the comments in a related post that I read before writing this pointed that out. Unfortunately I do not view this as helpful to a pro-carriage-horse argument. In fact, I think that the sanctuaries exist in the first place proves that there is a better alternative. I think one thing we can all agree is that the place where the horses go for their “vacation” is far closer to resembling a desirable habitat for them than are the streets of New York. I guess my question is, and perhaps one of you can answer this, why are we forcing them to come to the city at all? Is the alternative, their vacation spot, considered worse? Or would their sanctuary not have the capacity to support all of them at once? I also did not know how much the average wild horse walks each day, that was very interesting to learn. I do not think wild horses have carriages attached to them, so this may be a factor. What I was trying to say was that I have always felt that horses forced to work in New York City seemed unnatural and wrong. Growing up in a very rural part of America, I had always assumed horses belonged near grass and plant life, though of course there may never be a way of being sure what a horse is thinking. Seeing the advertisement was a surprise because I did not realize that there was actually an organized movement of people who felt the same way. I will definitely take a visit to the stables near my apartment this weekend and report back. I have walked by them quite often as the horses leave in the morning, and they appear to be in a dark warehouse, so perhaps it is sunnier inside. I guess a remaining issue I have, especially after reading both of your very informative comments, is if we can agree that there are better places for the horses to live (their sanctuaries and environments closer to their natural habitats), then why aren’t they there year round? (I will differentiate between NYPD horses and carriage horses, as I think there is a stronger argument that NYPD horses are essential to some police assignments). Thank you again both for your replies. I will write more soon in hopefully a more thorough response when I have more time. Rachel – Please, please, PLEASE tell me what piece of literature you got this solid scientific fact from: “common sense states that 99.9 % of the time horse and carriage operations are treating their horses better than their children.” Wow. Just wow. Christina – you’re clearly in the horse carriage biz so I’m assuming thats why your comments are so ridiculously bias. And thank you for your link to the pictures of the TINY horse stalls on 52nd Street–you have just helped prove the blog poster’s point. To both of you: Just because there are laws on the books to protect these horses, doesn’t mean the horse owners actually abide by them, nor does it mean that they are monitored closely. If you two live in NYC then you know damn well you’ve seen those horses out working near the Park in conditions worse than those indicated in your posts (above 89 degrees, below 15 degrees, and 55 with precipitation…give me a break!). Post back when you do your own actual research instead of copying links from a horse carriage advertisement website. I hate responding to anything, but I can’t stand liars. Margaret, Christina and Rachel’s posts don’t bother me, suddenly “I’m on a horse” comes along… This is either some shill for the anti-carriage industry or an idiot. 1. Quoting Dr. Phil? You are incapable of good judgement if you trust his. 2. “If you live in NYC you know damn well…” I live in Manhattan, I was born here. You don’t know what you are talking about. You are lying. Either you DON’T live here and you are passing along something someone told you or you live here and you are lying. The ASPCA always sends officers to the park when a day is predicted to be close to 90 degrees. They take on site temperature readings. When it’s too hot the horses are sent back to the Stables. I witnessed this numerous times this summer. Below 15 degrees? Are you out of your mind. I’ve never seen a horse on the street below 15 degrees. I’ve been to the stable by my home on 52nd street. If you think those box stalls are small you really don’t live in NYC… you don’t know what small is. (also I would hate for you to see the stalls the Police Equestrian Unit uses… they are 1/3 the size. In closing, “I’m on a horse”, stop posting lies on the internet. Stop pretending to be from New York. If you live here you don’t say you are from NYC, you tell them the borough… unless you just moved here and live in Staten Island. Thank you, Native New Yorker! Margaret – I greatly appreciate your thoughtful reply. The truth of the matter is that horses not only have always been in the city, but in fact they thrive. Work (at a walk) is healthful and beneficial. Horses who are simply “turned out” at “sanctuaries” don’t do as well as horses that get routine, regular interaction. I know many carriage drivers who fret constantly about their horses who are on turnout, because they AREN’T being supervised by the driver themselves or by stablehands 24/7. The horses in the city have only recently (in the last 50 or 60 years) become “unnatural.” Horses have long been with us in the city and stabled. Perhaps your sense of “guilt” should be mined more deeply. I don’t know you, but perhaps that guilt is a deeper sense of guilt about what we as a society have done to the city to make it *seem* unfit for horse (and by extension, human) habitation. Perhaps the guilt is that our widely-supposed reliance on fossil fuels and the internal combustion engine has multiplied traffic beyond all reason or necessity. Perhaps it is guilt that except for the lucky few who are carriage drivers, we have traded in a life in partnership with animals, and in tune with nature (when was the last time you spent 9 hours outside for an entire week? what about all of your working life?). I don’t know, but I think that this “guilt” of yours deserves an even deeper exploration. I also think that this pervasive sense of “guilt” (about things unrelated to the blithely content carriage horses) motivates all too much of the anti-carriage-horse extremists. As to the poster, “I’m on a horse!” I only have this to say. You discredit anyone who knows anything about the carriage industry on the basis that they are somehow affiliated with the carriage industry. That, my dear, is akin to saying that we should never turn to brain surgeons for information about neuroscience, because brain surgeons make their living off of finding things wrong with brains, and instead we should only get our information about neuroscience from people who never went to medical school! Or, to put a finer point on it, we should seek all our legal advice from people who tell lawyer jokes and *may* have sat through an episode of Law & Order, instead of from someone who has a license to practice law, because their experience inside the courtroom means that they are too “biased” to tell us about what goes on inside the courtroom! The absurdity of your logic should be obvious to all. As promised, here is a slightly more detailed rebuttal. I apologize for the delay as I have been consumed with way too many projects considering how nice the weather is becoming. I am writing again because I feel that I should defend my research more than I did in my original response, and I would also like to explore the issue further. I certainly do not cuss out my boss at my job. However, your comparison is not equivalent since the horses are not the bosses of the carriage owners, but rather the other way around. On that note, I do quite often cuss out my computer at work, as well as certain printers, files and cases. I think this is a more logical comparison; I USE certain things to DO my job, as carriage drivers USE the animals to DO their job. Let me be clear that I am NOT intending for this response to accuse carriage drivers of abuse; I certainly have no information for that nor do I personally believe it happens on any widespread scale. I am however, pointing out that your analysis is incomparable. I am not really sure where to go with this. It is disjointed at best, nonsensical at worst. I thought that your main critique was that I did not do enough research, but you are pulling a random percentage out of the air based on a “common sense” that…. carriage owners do not feed their children? If you explain or rephrase this, I might better know how to respond to it. Also, I hope that I cleared up the Kelly Clarkson misconception in my earlier post. I mentioned the advertisement because prior to seeing it, I was unaware that there was a movement behind the contradictory feelings I would get seeing horses pulling carriages in car traffic. I do not base my opinions, my iTunes, or anything else in my life on Kelly Clarkson, but it was the first time I had seen a pop culture figure devoted to that cause; I am sure there are more devoted to both sides. To clarify– I am not a “devotee” to the 1908 essay you cite. Also, thank you again for the Equiculture website. It was helpful to read the position of a website that takes a pro-carriage horse position. I see that most of the laws and facts you cited were taken from this website, which is fine, but I do think that this contradicts your own criticism that I “do research outside of websites that already agree with [me]”. I actually thought that the Comptroller’s website was a fairly objective source. Furthermore, I want to note that I found a lot of information from anti-HDC sites that I chose not to use, since it did not help my argument. For example, many websites cite the deaths of horses in traffic. While these deaths are brutal, unsettling, inexcusable, and utterly avoidable, they are simply not that common. I did a significant amount of research for this before posting, but chose only to include facts that I thought relevant to my argument (that horse drawn carriages are unnatural in New York City, and the lack of relevant city agencies tasked with their official supervision them further complicates the issue). If I wanted to post a picture of a dead horse, I am sure that may pull at the heartstrings of people and may even help my cause, but I want to be clear that I was very deliberate in deciding which parts of my research to post in the hopes of keeping my official “sources” objective. In addition, I think that it is worth noting that IF any offensive violations DO exist at a stable, they would probably not be highlighted during a planned visit of a NYS organization (please do not take this as a conclusory statement about stable conditions, but more of a suggestion that results from planned visits of any kind, to any place, should be taken with a grain of salt). As far as my “guilt” goes, I appreciate your attempt at a psychoanalysis, however I think you are reading a little to much into it. The process happens as follows: (1) I see an animal outside of it’s natural habitat; (2) it is dressed ridiculously; (3) it is stuck in traffic; (4) it is safe to assume it would rather be walking without a carriage attached to it than with one; and (5) there is nothing I can do about it. (2-5 not necessarily realized in that order.) That is the beginning and the end of that guilt. I do not feel guilty about the traffic congestion (in fact, I am extremely proud to live in this city as New York produces only 1% of greenhouse gas emissions in the US while accounting for almost 3% of the US population (http://www.nyc.gov/html/om/pdf/ccp_report041007.pdf). 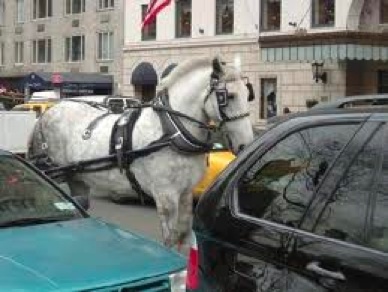 I do not feel guilty about “trading a life… in tune with nature,” as you say the carriage drivers have managed to keep (questionable– my brother studies algae in upstate New York, I think he would beg to differ that an NYC carriage driver’s job is in tune with nature). The guilt is simply seeing an animal as far outside of its natural habitat as it could possibly be, doing something it would not have to do if tourists did not demand it, and not being able to do anything about it. In addition, I did not want this post to be about carriage drivers, but I see that the conversation tends to drift that way when we bring up this issue. As I said before, I do not have any reliable info regarding how they do or do not treat their horses, so in that regard it was interesting to learn about their relationship with sanctuary supervisors. That said, the idea that they worry about their horses when they are in sanctuaries is double-edged. It is good to know that the drivers “fret constantly” about them, but why? Is it because the horses will get so comfortable, they will not want be as “happy” to do their job? I agree that many animals exist better in companionship with humans. I agree that many animals benefit from exercise. I disagree that forcing a horse to drag carriages and tourists through NYC traffic is a great thing for the horses that I should be appreciating. The sanctuaries sound like a great place. Putting human concerns like pleasing tourists aside, what is the down side to, starting tomorrow, putting all of the NYC horses in sanctuaries for the remainder of their lives, to be cared for by humans? I think that the “55 degree and raining” comment was actually cited first by Christina as relevant law. I would venture to guess that the idea I’m On A Horse is getting at is that it is very believable that those laws are not strictly enforced. For example, living in NYC, you know that last summer the temperatures were above 90 degrees for almost 3 weeks. I saw the carriages out. Period. Also, I am not sure how conclusive the statement that “if you don’t name a borough, you are not from NYC” is. I get what you’re saying (sort of, although I can name several thousand situations where this is not true), but I don’t think the commenter ever said where they were from anyway. I hope we can keep up this discussion. I apologize again for the delay. Yesterday I stopped by the 52nd St stalls. There were only two custodians working so they told me to come back during the week to see the horses (understandable, it was a Saturday). In an ideal situation I would be able to link up with one of the carriage drivers for a day and get perhaps the most reliable research yet. Thank you for your thoughtful (and polite!) reply. The reason why the website, http://www.equiculture.org, in question is something I “agree with” is that it is a website that has been compiled from research I have done IN PERSON in visiting the horses on numerous occasions, watching them at work and talking with their drivers/owners. Now, these horses CLEARLY know that the truck = getting hooked up to the carriage, yet they can’t wait to get on the truck and go to work. In short, there are more things in heaven and on Earth (and in the carriage stable) than are dreamt up in your philosophy. If you are truly serious about “doing further research” in person, let me know, and I can put you in contact with the people you need to talk to . P.S. Congrats on the air quality in NYC – the ozone pollution according to the American Lung Association’s “State of the Air” rated a weighted average of 4.0 for the city (low is good, high is bad). Meanwhile, Hunterdon, NJ, where the real-estate developer, Steve Nislick (who is leading the movement to get rid of the carriage horses in NYC) keeps his horses, has a rating of 12.2 – far worse. Your anecdote is interesting, but it is simply not even remotely persuasive. First, you describe a group of horses resting in the countryside. That sounds nice– my first reaction was envy. But then the story of one day, a carriage driver in a different part of the country was surprised when he didn’t have to force his horse onto a trailer, is indicative of next to nothing. I understand that you mean for that story to represent how the population of NYC horses, or carriage horses generally, must feel, but I think that is a pretty far stretch. is wrong. The only thing it could possible “clearly show” is that a horse would prefer to lead itself to place X than be led there (with place X = some place that it will be forced to go eventually anyway). You are jumping far too many intervening events to make a conclusive inference that “H gets into trailer without help” therefore, “H prefers being attached to a carriage.” Could it perhaps be that because the horse has gotten into a trailer and made the journey a dozen times before, it is simply doing what it knows is inevitable (ie, a human will eventually make it get in the trailer and subsequently attach to the carriage anyway). In that case, what about the horses who voluntarily get on trailers that leave the city stables to go to the country? Use of your same analysis would void your theory. When it occurs in both situations, it equally proves AND disproves both of our theories. If you had told me that the horses had been breaking out of the sanctuaries and buying MetroNorth and LIRR tickets to get back here, and that the NYC horses had organized a peaceful protest in the form of a blockade on 5th Avenue to avoid being sent away from their stables, I may admit it to be a pretty persuasive show of preference, but some horse, in some part of the country, getting onto a trailer that it would have been made to get onto anyway… not so much. Simply put, one anecdote, and that anecdote in particular, falls far short of proving anything. As always, thanks again and I hope to stay in touch on this matter! I am, I admit, supplying a somewhat “random” selection of anecdotal evidence… I received your reply literally at the same time I was reading about my friend’s horses… and remarking to her that carriage horses behave in very similar ways wherever I’ve encountered them, whether in the big cities of the east coast or elsewhere. I also just came from discussing ozone pollution, and how what we *think* we know about pollution (that the country MUST be better than the city), like so many things we *think* we know, ends up oddly not holding up under the scrutiny of science. None of these little points is taken alone is designed to “win” an argument on its own… I merely citing some off-hand observations from my day today as part of an accumulation of evidence that, from my experience, indicates that carriage horses are well-cared for and enjoy their work. As for whether or not anyone should believe me or anyone associated in any way, shape, or form with working horses, I feel that my analogy about seeking legal advice from lawyers is a more apt analogy than yours about the EPA asking factory farmers to report on greenhouse gases. Treated properly and in a safe environment, I think it can be a good thing. Kids like horse rides and the few times i’ve actually seen a horse-drawn carraige (an Amish family coming in to town in upper MI), kids were petting it and it seemed pretty happy with the attention. Depends on the horse and the human, i guess. Oh just to correct another misconception: Horses do not “pull” a carriage, they “push” against the harness which “pulls” the carriage. It’s simple physics. Attended an anti-horse rally at Central Park, yesterday, July 27. When we shouted at him, he WHIPPED his horse again, even harder! His plate number was: 1062. So much for all your meaningless platitudes extolling the praises of an industry, where only the BUCK counts, and if you think differently, then you are a damn fool!! I felt that way too about wondering if the horses are afraid of the cars or if they even collide with them at all, or what happens if a back fire happens right next to them and they start running? etc. Author: Ronald Senn, VP Ideal Wine Coolers, October 2009.
sixties, they pleased the aesthetically inclined who were tired of the. keep an eye of your child while cooking dinner.